There’s nothing quite like gathering the family around the table for a game night. Whether it’s slapping furiously for Hungry Hungry Hippos, trying to avoid Boardwalk in Monopoly, or avoiding the edges in Operation, you can do some ridiculous things in a board game. However, there are also some games out there where you could be learning while you play. This week, Ryan and I want to talk about some games that will spark your creativity. In these games, you’ll weave an intricate story, explain ridiculous laws, and more. Ric: This is one of the more popular games, but it’s still a good one. The original version of this game had players providing definitions to obscure words like , but in the last 10 years the gameplay has expanded to include 4 different other tasks. On a given turn, players may be tasked with providing the synopsis to a movie title, explaining an acronym, and more. So be prepared to make up details about the plot of Phfft! or try to explain what MBBS stands for. Now it would be a bit of a stretch for us to say that kids will expand their vocabularies by playing this game and learning the words involved. However, I do believe that a kid could learn and practice concepts like word roots and origins as they answer the questions. I also believe that they will be stretching their imagination as they come up with their answers. I would mostly recommend this for older kids as their answers may be more convincing, but there does seem to be a Balderdash Jr. out there, so perhaps that could be considered. It’s a pulchritudinous (breathtaking) experience if I do say so from my perspective as a dilettante (look it up yourself). 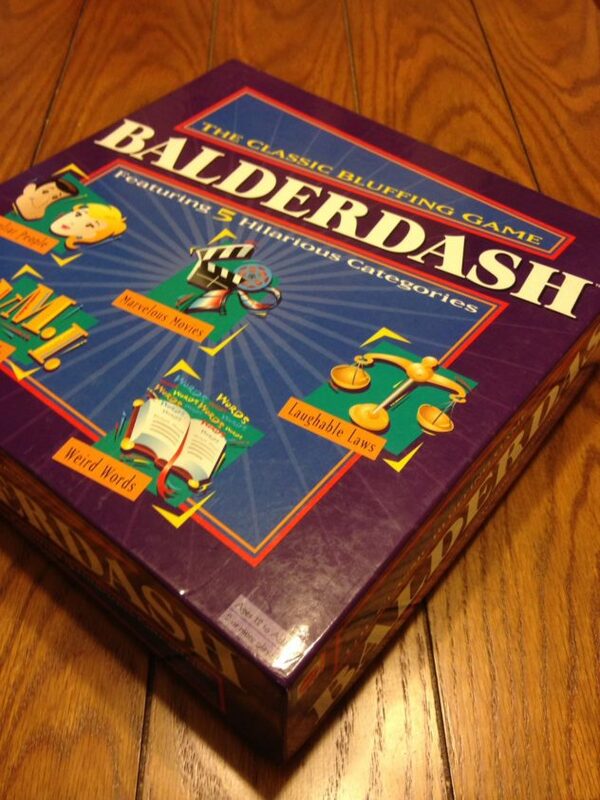 Balderdash is available at most big box stores or can be ordered through Amazon. Ryan: Have you ever heard someone tell a story that they couldn’t finish because they are laughing so hard? This seems to happen a lot with Rory’s Story Cubes. This little bag of dice that comes in a couple different themes are a ton of fun. The player rolls the 9 dice and arranges them in any order they want. The player has to tell their story, however absurd, using the symbols on the dice. I love the way our kids imaginations come to life as they interpret the symbols and try to work their way through all 9 cubes. I’ll never forget the insane story my oldest daughter told about the depressed building that fell in love with a pyramid that had a magnetic personality. We couldn’t stop laughing as we waited for a table at the local Texas Roadhouse. The game is quick, super portable and really encourages imagination no matter what age you are. Ric: If you’re reading this article, you’ve probably played Apples to Apples before. While that game was great, it seems that the ship has sailed, and many gaming groups are looking for some alternative. Enter Dixit. Instead of using words, Dixit includes dozens of cards with beautiful, abstract, and sometimes bizarre artwork that depicts ridiculous situations. Expect a man riding a giant goldfish in the forest, or a beautiful red rose in the middle of a field of white flowers. Each turn, one person serves as the prompter (I don’t know if that’s the real name, so just go with it). They will submit one card with a clue. Every other player then tries to select a card of their own that they believe matches that clue. Once everyone has submitted, all the cards are flipped over, and players vote on which card they believe was submitted by the prompter. Points are awarded for correct guesses and for fooling other players. While the game provides some opportunities for descriptive language, I believe the cards themselves can be used as a learning device. In my Language Arts classroom, I once had students each draw a card, then write a descriptive narrative from that card. It led to some great writing pieces and helped us to have a discussion about vocabulary and sentence structure. While you may not want to give your child a homework assignment, this game could possibly spark some great creative discussions in your family. Dixit is available through Amazon or at your local game shop. There are tons of additional add-on’s that will keep this game fresh for a long time. Ryan: This game is from the publisher Asmodee and comes in two varieties currently. There is a Fairy Tales version and a Scary Tales version that releases in October. Both varieties follow the same formula and anyone who has played Apples to Apples will be familiar with it. The narrator starts the story from a deck of cards that is numbered to guide the players through the story. 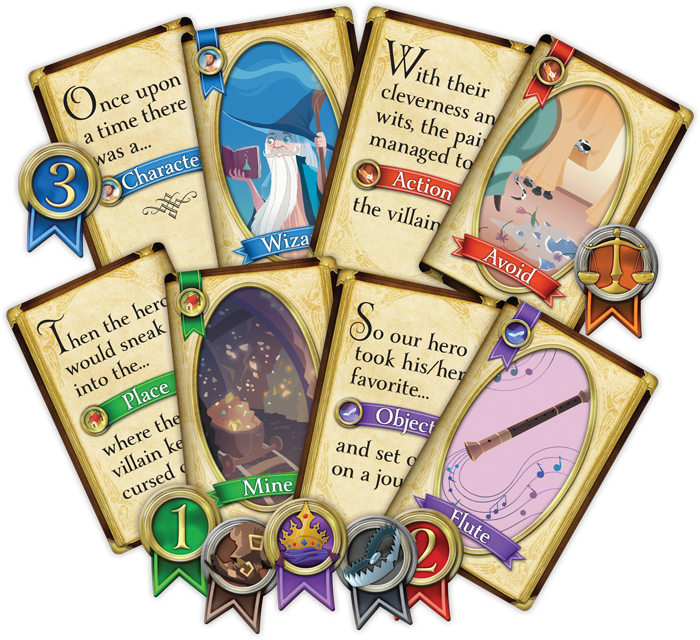 On each card, there is a prompt for players to submit cards that introduce characters, places, events and objects into the story. The narrator shuffles the submitted cards and picks the best option for the story. Players are encouraged to embellish and use their imagination to create this elaborate tale. This is a game that is a perfect fit for families or groups that have big imaginations and a desire to share larger than life stories. I know our family is really excited to get our hands on the Scary Tales edition the moment it comes out. It will be the perfect game to gather around the table during the Fall with the smell of chili cooking on the stove. You can pick up Storyline: Fairy Tales via Amazon today and look for the Scary Tales edition this Fall. We want to know what your favorite storytelling games are! These 4 games only scratch the surface of the games that are available in this genre. Post your favorites in the comments below.